The Columbus Blue Jackets have had an up-and-down campaign in 2013-14, after NHL realignment shifted the team to the Eastern Conference. After a slow start, an eight-game win streak in January propelled the Jackets back into the Eastern playoff picture, where they now sit in one of the wild card spots; they’ve also won three in a row to begin the month of March, outscoring opponents 12-6 in that span. Despite Chicago’s four-game sweep over their former divisional rivals last season, each of those games was decided by just a single goal. Columbus has faced off against every other Western team except for the Blackhawks, and they enter Thursday’s tilt with a 9-9-2 record against their old conference. Far removed from the days when the team relied heavily on Rick Nash, the Blue Jackets have benefited from a more balanced offense this season — one that ranks seventh in the NHL with 2.90 goals per game. Scoring has been largely accomplished by committee, although 21-year-old Ryan Johansen has been their breakout star this season, leading the team with 24 goals and 48 points. Former Chicago defenseman James Wisniewski leads the team and shares 11th among league blueliners with 32 helpers, and sniper Artem Anisimov has been the team’s driving force since the Olympic break, compiling a four-game goal streak, which includes three consecutive game-winning goals and a multi-goal effort in a 4-2 win over Dallas on Tuesday. Reigning Vezina Trophy winner Sergei Bobrovsky has followed up his superb 2013 season with a workhorse campaign for Columbus, winning 23 of his 41 starts and posting a 2.52 goals-against average and .917 save percentage. The Russian Olympian is a bit of a mystery to the Blackhawks, who have faced him only twice in his four-year career. Bobrovsky has a 1-0-1 record against Chicago, but has only allowed two goals in those two outings, so testing him early and often will be a key objective for an offense that has scored more than two goals in a game just twice in their last seven contests. Jonathan Toews is still on a roll: After posting three points in the Stadium Series showdown against Pittsburgh, the captain tallied his 22nd goal of the season on Tuesday against Colorado, tying the game at 2-2. Toews also won a game-high 10 draws; his 718 wins at the dot rank fourth in the league this season, and he shares ninth with a 56.0 win percentage. Look for the captain to continue his hot streak tonight, as he’s collected 13 goals and 21 assists in 34 career matchups against Columbus — his best output against any team in the league. Both Chicago and Columbus were active around the trade deadline, although Blackhawks VP/GM Stan Bowman didn’t make any major moves. After sending a fourth-round draft pick to the New York Islanders for forwards Peter Regin and Pierre-Marc Bouchard (currently with Rockford), the Blackhawks extended Brandon Bollig — who picked up an assist on Tuesday — for three more seasons, then acquired defensemen David Rundblad and Mathieu Brisebois from the Phoenix Coyotes. Rundblad, a 23-year-old Swedish native and Regin’s former teammate with the Ottawa Senators, will most likely not play until Sunday’s tilt at Buffalo. Meanwhile, the Blue Jackets dealt top-six forward Marian Gaborik to the Los Angeles Kings in exchange for grinder Matt Frattin and draft picks and traded for defenseman Nick Schultz from the Edmonton Oilers. Chicago’s offense faltered on Tuesday, despite logging 38 shots on goal and converting one of four power plays against the Avs. They’ve historically dominated Columbus in head-to-head matchups, having posted a 43-23-2-5 record since they entered the league in 2000, but the gap has narrowed in recent years as the Blue Jackets have added more talent to their system. And with the team fighting to secure a playoff spot in the Eastern Conference, they’ll arrive with plenty of incentives to push the Blackhawks hard. 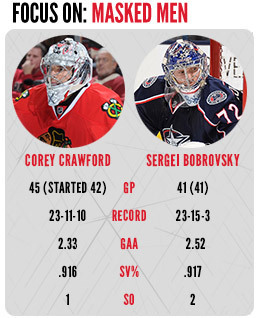 And for the second tilt in a row, Chicago’s forward corps will need to get their shots past a talented goalie — 2013 Vezina winner Sergei Bobrovsky, in this case — who is more than capable of stealing a win.